These festive dishes were a big hit last year with Tony Roma’s fans, so we’re excited to bring them back to the menu as a tribute to one of the greatest worldwide celebrations – Cinco de Mayo. 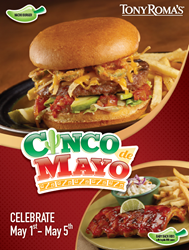 Romacorp, Inc., parent company of Tony Roma’s, is cooking up a fiesta for Cinco de Mayo and bringing back two fan favorites – Tony Roma’s Original Baby Back Ribs smothered in Tequila BBQ Sauce and the zesty Nacho Burger. Adding a south-of-the-border flare to two of Tony Roma’s classic menu items, the Tequila BBQ Baby Back Ribs and Nacho Burger are available at participating U.S. locations from May 1 – 5. Tony Roma’s world famous Baby Back Ribs are the star of the party, lathered with a special BBQ sauce infused with tequila, created by Tony Roma’s Chef Bob Gallagher just for this special occasion. The baby back ribs are served with a side of French fries and coleslaw. The Nacho Burger comes to life with a fiesta of flavors from the zesty salsa, tortilla strips, cheddar cheese, jalapeños, and avocado. Both fan favorites add a flavorful twist to the Tony Roma’s experience. Romacorp, Inc. is the parent company of Tony Roma’s restaurants, the world’s largest casual dining concept specializing in ribs. Headquartered in Orlando, Florida, Romacorp, Inc. has more than 150 restaurant locations in more than 30 countries and is one of the most globally recognizable names in the industry. The first Tony Roma’s restaurant opened more than 40 years ago in North Miami, Florida. For more information about Romacorp, Inc. and Tony Roma’s, visit http://www.tonyromas.com.